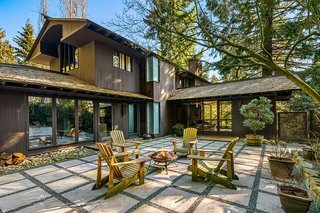 This beautifully maintained midcentury home was designed in 1962 by Seattle–based modernist architect Ralph D. Anderson—who was an early advocate for preservation in the region. 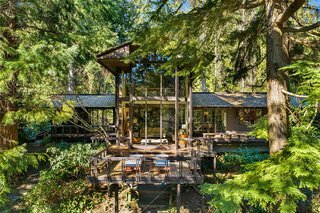 A soaring, double-height wall of glass in the living room brings a sense of the home's forested surroundings to its interiors. 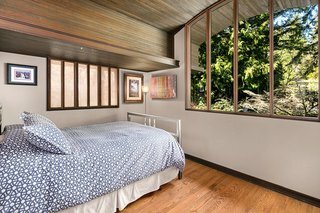 Character-filled elements of the home's midcentury roots remain—including a slightly sunken living room, a circular staircase, a tongue-and-groove ceiling, wood paneling, and a kitchen countertop crafted of salvaged teak from a 1960s battleship. The Northwest Regional Style emphasized verticality, large windows, exposed framing, and often a formal T-shape plan. 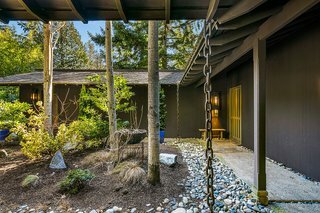 Located just north of Seattle in Shoreline, Washington, the home is set on Hidden Lake, and it quietly overlooks the Puget Sound and the Olympic Mountains. Anderson himself lived in this forested suburb, and the lush landscape is reflected in his work. 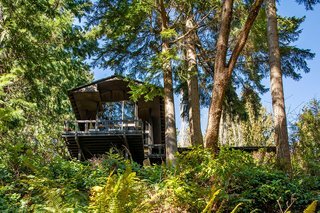 The architect sought to incorporate "the contours, textures, and vegetation of the Northwest, the wooded environment" by employing "big, hovering roofs that would open up to the view." The side approach to the home. 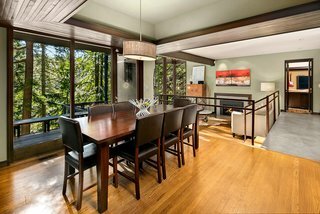 Overhanging eaves provide shelter from the rainy Pacific Northwest climate. 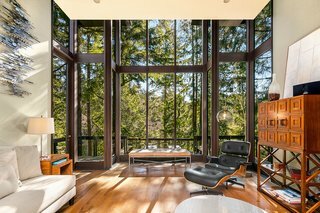 The living room features soaring double-height windows which fill the home with natural light and views of the surrounding forest. The dining area overlooks the sunken living room. 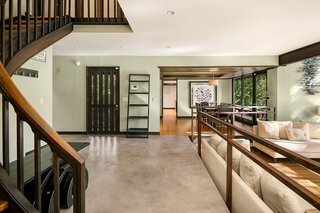 A glimpse of the circular staircase and the sunken living room. 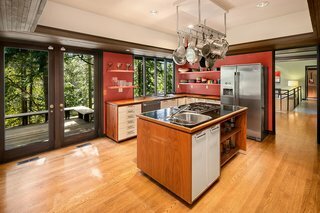 The original kitchen countertops (on the left) are made of teak salvaged from the Battleship Colorado, which was dismantled in 1960 in Bremerton, Washington. Built by master craftsman Flemming Sorensen, the surface is screwed down, and the screws are plugged—mimicking the way the deck of a boat is installed. 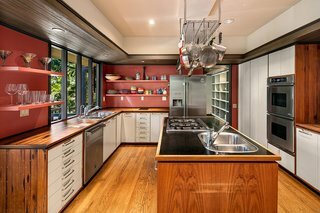 A pulled-back view of the kitchen shows how the space connects to the rest of the home and opens to the outdoors. 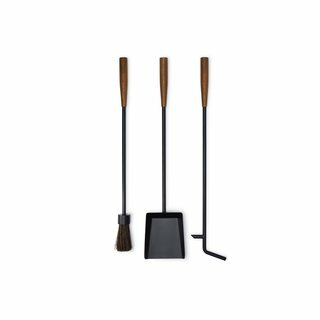 Possessing one of the most inventive minds of the 20th century, George Nelson described his creative abilities as a series of “zaps” – quick flashes of inspiration he turned into innovative design ideas. In 1945, Nelson became director of design at Herman Miller, a position he held until 1972. 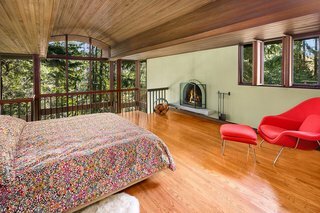 This bedroom takes advantage of the double-height ceiling and benefits from serene forest views. One of the home's three bedrooms. A view of the exterior sitting area. The home is perched on a hill overlooking Hidden Lake. 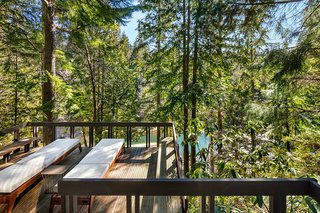 The deck looks out over the forest, with a glimpse of the lake. 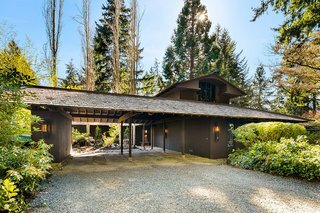 17020 10th Ave NW, Shoreline, WA is currently listed for $1,499,000 by James Dainard and Katie Kepler of Heaton Dainard, LLC.